Indepth and useful Buyers Guide for those considering a Technivorm Moccamaster coffee maker or comparing other high-end coffee makers to a Moccamaster.Important information and reviews to know BEFORE you buy a MoccaMaster coffee brewer. Today, we’re taking a look at the Moccamaster KBG 741 10-cup coffee maker with a glass carafe made by Technivorm. Since Moccamaster is a high-end coffee maker, we will be digging deep into the details, complaints, and reviews so you can be SURE before you buy. 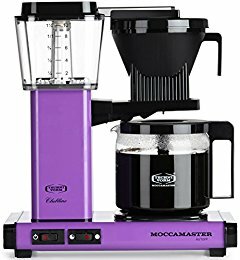 We will also talk about other Moccamaster coffee maker options (such as brewers with a timer, a grinder, and/or a thermal carafe), any complaints about these coffee makers, and inexpensive alternatives to a new MoccaMaster coffee machine. So, grab a cup of coffee and let’s get into this review and you’ll see why this 10-cup coffee brewer was awarded Best Coffee Maker of the Year. note: If you’re looking for a deal on a refurbished Moccamaster Coffee maker, check this page to see what refurbished models are available. Let’s jump in and see if this Moccamaster coffee maker is worth the money or over-priced and over-hyped junk. Moccamaster coffee makers are superb. They are quick to make coffee, they are quiet, the coffee brewer system is easy to use, the coffee is always excellent and the temperature is consistently hot with no aftertaste. 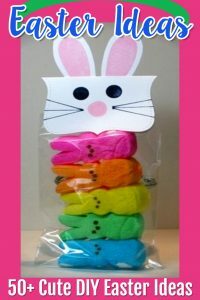 Available in an AMAZING assortment of colors. Check all color options here. Here’s a diagram picture to show you all the fabulous features of the Moccamaster KBG 741 coffee maker. 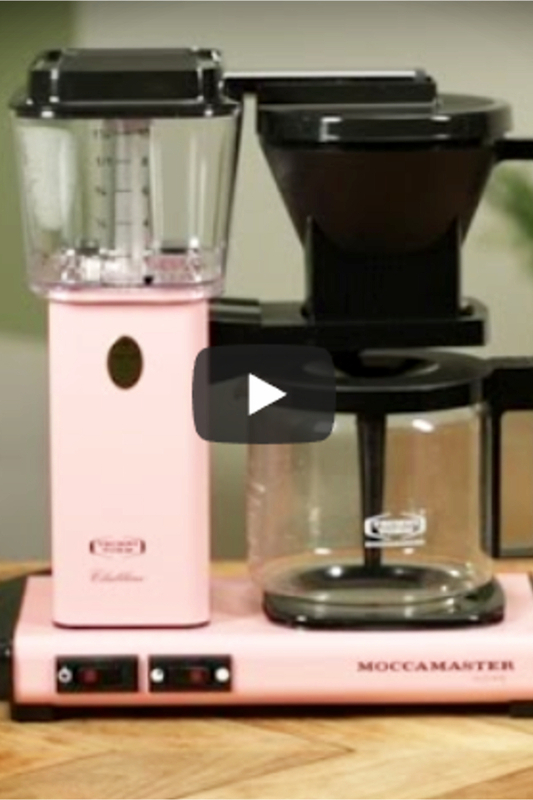 Here’s a quick video showing how to make coffee with a Moccamaster KBG 741. 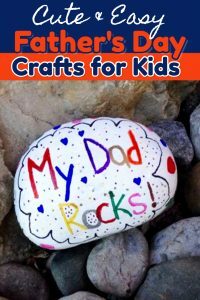 Here are some reviews from various trusted resources online. 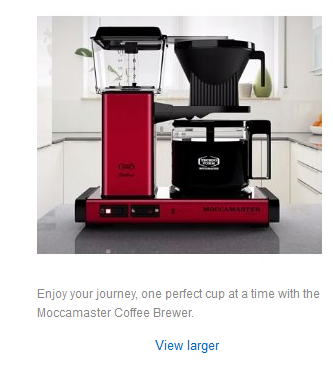 “…I recently used the Moccamaster KBT-741, made in the Netherlands, at home for a weekend. To my untrained palate, there was a noticeable difference between the coffee my machine brews and that from the Technivorm. 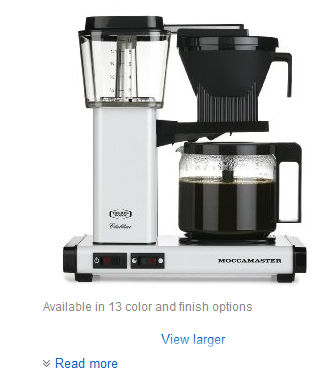 Many other Starbucks customer reviews say that having this Moccamaster coffee maker is like being able to have the taste of Starbucks in your kitchen. Now, THAT is a compliment! 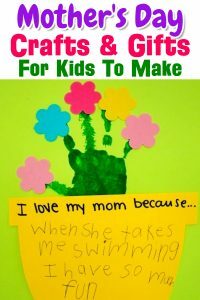 As expected, the reviews on Amazon are very positive. 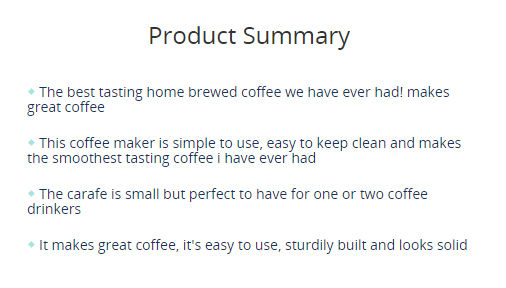 Most of any negative reviews this coffee maker received, were complaints about the shipping for a specific 3rd party Amazon seller – not complaints about the coffee maker itself. As always, we are concerned about the possibility of fake reviews on Amazon so we ran a test with our Review Analyzer Tool to check the legitimacy of the current consumer reviews on Amazon. The folks over at Seattle Coffee Gear are also big fans of the Moccamaster KBG741 coffee maker. They also give this Moccamaster coffee maker 5 out of 5 stars for Ease of Use, 5 out of 5 stars for Ease of Care & Maintenance, and 5 out of 5 stars for Overall Value for the Money. Watch this quick review video of this Moccamaster coffee maker. If you’ve looked at other styles of these coffee makers, you might be wondering which Technivorm Moccamaster to buy. 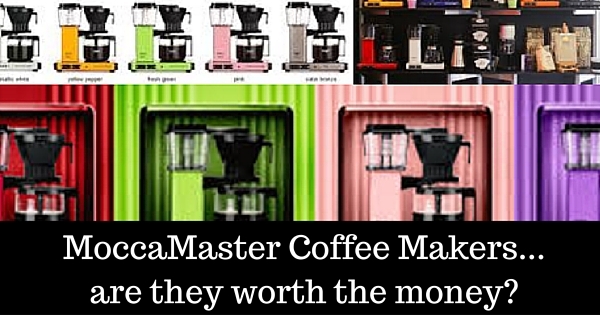 This video answers which Moccamaster coffee makers are best and which one you should buy. Learning how to clean a Moccamaster coffee maker is easy…. For best results, use Technivorm #4 coffee filters. You can also use a Medelco #4 Permanent filter as shown in the picture to the right – the permanent filters are found here. Some people have had problems with Moccamaster coffee makers. 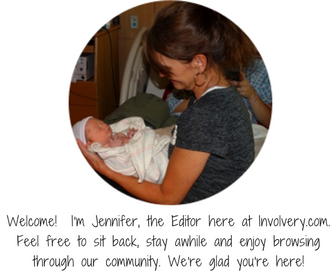 Naturally, some are simple user error, but some a genuine concerns. Here are some things people did NOT like about the Moccamaster KBG 741. When shopping for a high-end coffee maker, once should not be surprised by the price of a Moccamaster – but people still are. If price is a primary concern, take a look at these top-rated coffee makers under $50. The Moccamaster KBG741 has more of an industrial look to it that you would see in gourmet coffee shops. 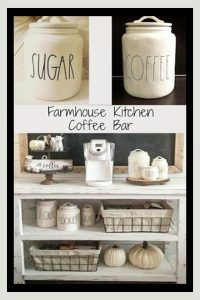 The style does not suit the decor of all coffee drinkers kitchens – it just might be too ‘fancy’. However, some consumers say it looks better in their kitchen than a Cuisinart coffee maker does – so keep that in mind. 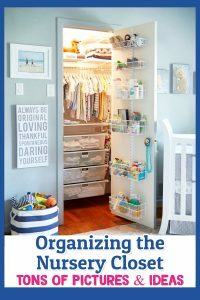 To me, the appearance of a Moccamaster coffee maker in my kitchen says that I am serious about the coffee I drink and serve to my guests – and it is always a conversation starter when guests see it in my kitchen. 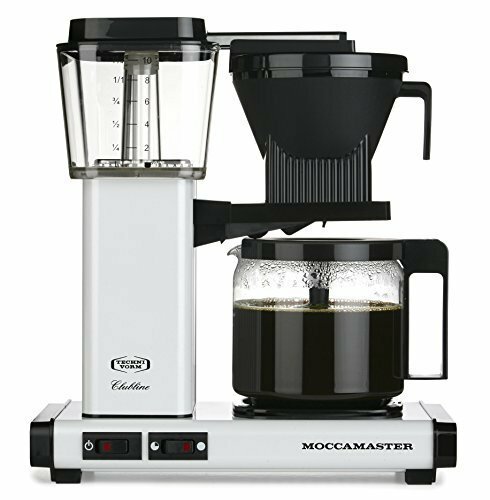 Worth mentioning because this might apply to you, but some people wish their Moccamaster came with a bigger carafe and could brew more than 10 cups of coffee at a time. 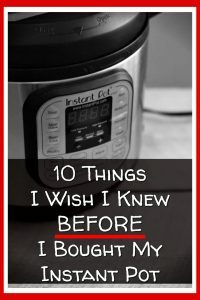 Personally, 10-cups is perfect for me, but you might want something bigger. Common questions and answers regarding the Moccamaster KBG 741 10-Cup Coffee Brewer. The red Moccamaster KBG 741 IS a true red. It’s a tad darker than a cherry shade of red. The KBG 741 dimensions are 6.7″ Wide x 13″ Deep x 14.2″ High. 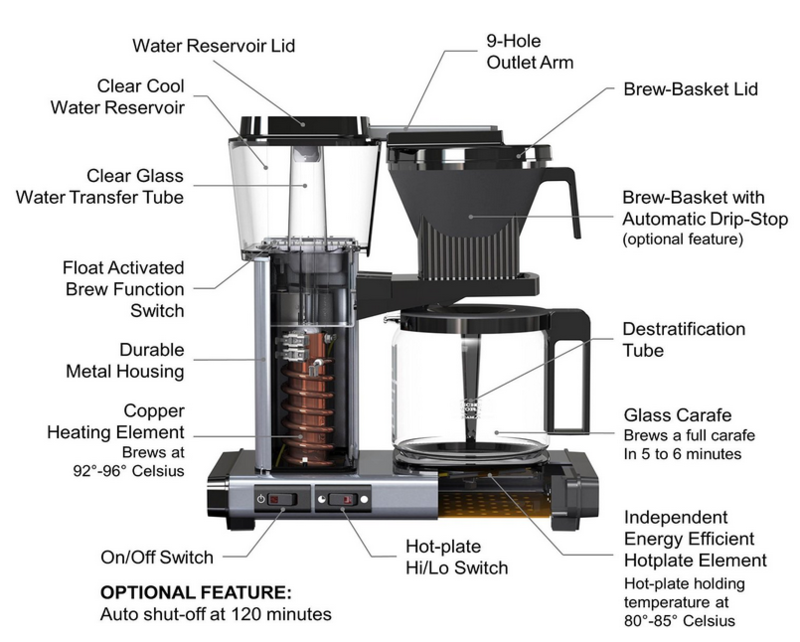 Most Moccamaster coffee makers do not have a stop-drip function (be sure to check the full feature list of the specific MoccaMaster you are considering). However, when making a good and proper pot of coffee, many coffee experts say that you shouldn’t use a stop-drip and get coffee before it’s finished brewing. There are many styles and models of Moccamaster coffee makers. Here are some of our favorites. Moccamaster coffee makers don’t come with timers. They DO have an auto-off feature, but no programming features. 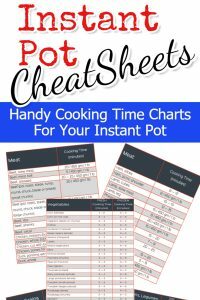 Below are good coffee makers with timers and programming. There are many styles/models of Moccamaster coffee makers. Hopefully, this chart will make it easy to compare the features of each and decide which one to buy. 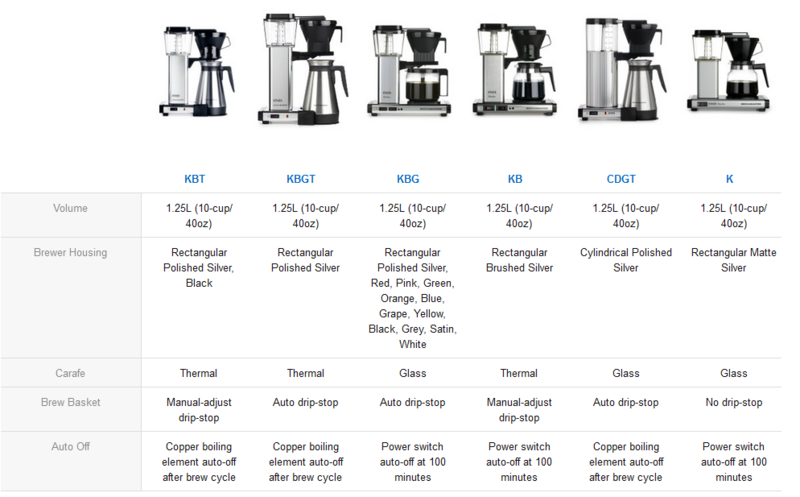 How does this Moccamaster coffee brewer compare to other high-end coffee makers? At first glance, the Bonavita seems to be smaller and take up less counter space, but that’s really not true. The Bonavita coffee maker is cheaper, which makes it a very affordable alternative to a Moccamaster. But taking price out of the equation, the Moccamaster is simply a much better coffee maker that brews a much better cup of coffee. Both coffee makers make some great coffee, but they’re so different that it’s tough to do an apples to apples comparison. 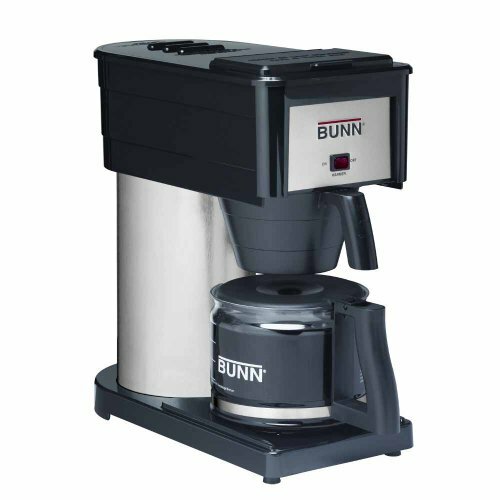 Bunn coffee makers use more electricity since you must keep water in it and keep it plugged in. However, the Bunn brews faster, if speed is more important than the quality of the coffee. This is a tough comparison. Both coffee makers are SCAA-certified – which means you’ll get an excellent cup of coffee from either machine. That’s the ultimate question, isn’t it? Is the Moccasmaster KBG 741 worth it? If you want a high-quality coffee maker that will not only last a long time, but also makes perfect coffee every single time you brew, you will love your Moccamaster. Here are some options of places to buy your Moccamaster coffee maker. From searching around, I also see the three sites below have the best prices and also run sales and deals on their coffee makers. Now and then, I can find this coffee maker at Starbucks and Walmart. Every now and then, there is one heck of a deal on a refurbished MoccaMaster coffee maker… you just have to know where to look to find them. Here are some more top-rated high-end coffee makers.